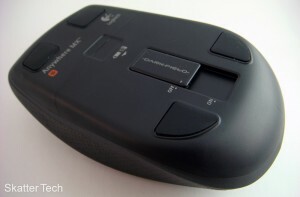 Last year Skatter Tech reviewed Logitech’s VX Nano mouse, which had an awesome battery life, was compact, responsive, and even came with a case. Logitech’s Anywhere Mouse MX lives up to its name. The Logitech Anywhere MX mouse is the next iteration of the product. It fixes many of the issues the original faced, has a better build quality, and even throws a few punches at competing products with the ability to work on glass. As the name implies, it truly can function just about anywhere. The form factor of the Anywhere MX is quite similar to the VX Nano. The MX feels as though it weights nearly twice as much mainly due to the use of 2 AA batteries rather than 2 AAA on the preceding model. The workmanship is excellent, just as it almost always is with Logitech products. From the minute you pick it up, you’ll know that it’s a high end quality product. The parts that previously had glossy plastic on the VX Nano are now covered with a chrome trim on the Anywhere MX. Scratches and fingerprints aren’t nearly as visible anymore. There’s a sliding cover which doubles as both the power switch and as a cover to protect the sensor from damage when in the “OFF position”. Other than that, there’s a large door on the bottom that reveals the batteries and a holster for the tiny USB Logitech Unifying receiver. 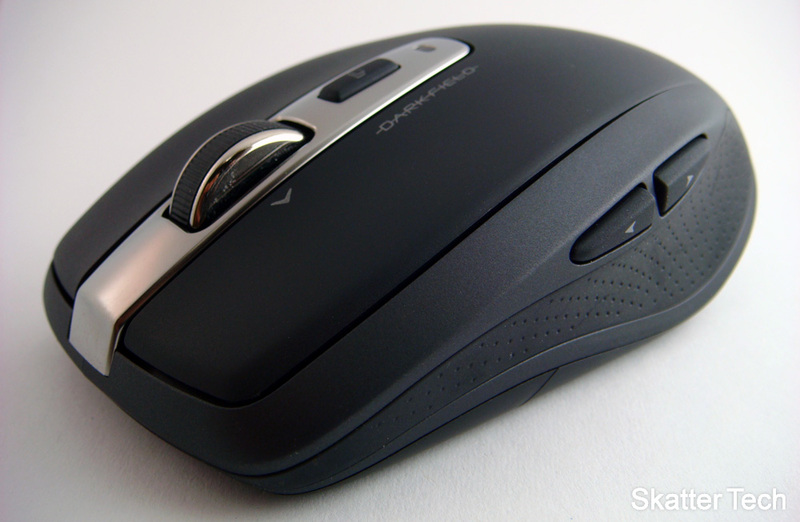 The Anywhere MX features all the essential buttons necessary to make a good mouse. This includes a left/right-click buttons, back/forward-keys, a scroll wheel, and a middle-click. Unlike the Anywhere MX, many mice such as the Microsoft Mobile Mouse 4000 often fall short in offering all of those basic keys. The Logitech even takes it a step further by offering a scroll wheel that can switch between a frictionless free-spin mode and a notched modes when the wheel is pushed in. The frictionless mode is great for flicking through long webpages, while the other mode is slower, but offers precision. The scroll wheel can also be leaned to the left or right for horizontal scrolling. The middle click defaults to the button placed right below the scroll wheel. Logitech made the wise decision to move the awkwardly placed forward and back keys on the VX Nano to the natural location of where the thumb finger would be located. The most important keys, the left and right click, have a strong and comforting feel. Overall, it’s a huge improvement over the VX Nano. Although I’m not taking a point off, I should note that this is a right-handed mice, it would be difficult for lefties to use this product. The greatest feature of this mouse is the new Darkfield Laser technology. It now can operate on virtually any surface including glass. Neither optical mice nor even Microsoft’s new BlueTrack technology can’t match it. The technology works by detecting imperfections and dust particles on the glass. It might not be as accurate as compared to using a traditional surface or mouse pad, but after a few tests on a glass desk, it seemed to work just well. Hard-core gamers will probably want a better mouse, but the precision of the new laser is better than any other mouse Skatter Tech has come across to date. 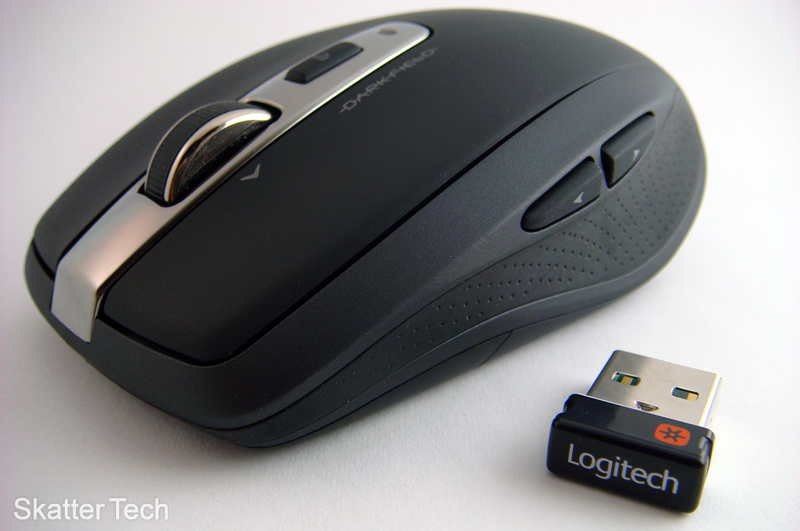 Although Logitech offers a CD with Drivers, everything worked right out of the box on both Windows 7 and Vista. Unless you want to customize functionality, it might even be better to not install the extra tools to save system resources. The transmitter is about the same size as the one included with the previous model. It’s no longer limited to pairing with just this Anywhere Mouse MX, but can also connect to other products compatible with the Unifying technology. The signal strength is strong enough to transmit accurately from at least 20 feet away. 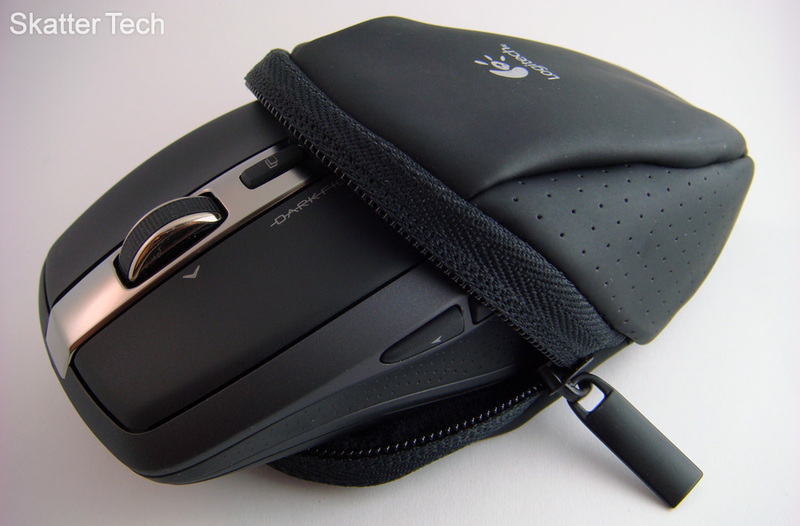 Logitech even throws in a neat little pouch to protect the MX Nano when traveling. Although I couldn’t test the battery life span for obvious reasons, Logitech claims about 6 months with normal use. I’ll take their word for it considering the history of their quality products. There’s no question that this is one of the best mice on the market today. Although I wouldn’t mind using this as a full time mouse, Logitech also offers a larger desktop version called the Performance Mouse MX. We will be reviewing getting a hold of that one soon. This mouse simply works on just about any surface one would come across. The only downside comes with the price. The MSRP is $80. However if you shop around it’s available for a lot less. Amazon currently offers it for $50 after a $10 rebate. With the comfort, features, the tiny receiver, and even a case thrown in, there’s no way you’ll be disappointed.